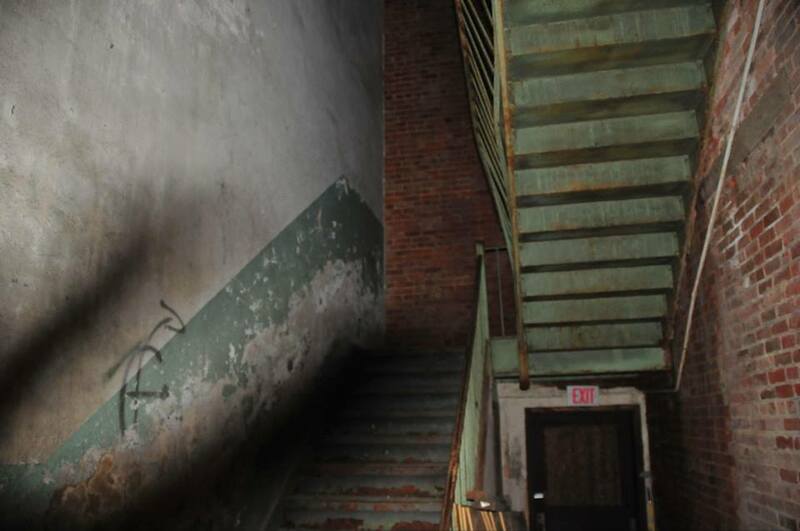 This photo was taken with a flash in a dark stairwell. 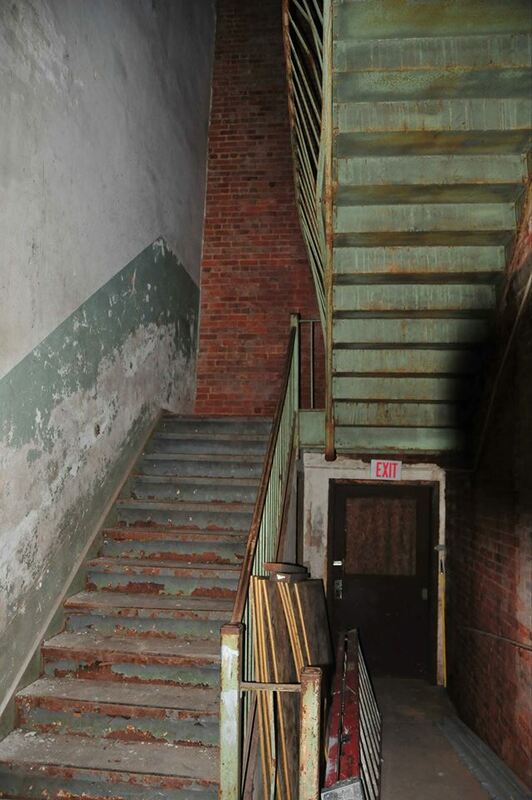 Note the shadow on the left, climbing the stairs and the wall. This photo was taken right after the previous photo. Note the shadow on the left is gone, but now there is a shadow on the right hand side. 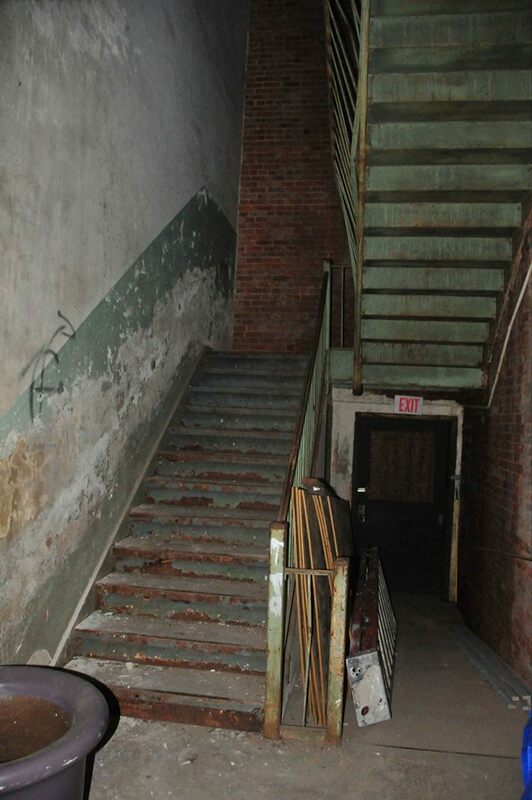 In the back of the hallway is a stairwell to the second floor. As the second floor is entirely out of comisssion, no one uses these stairs. When the first two photos were taken neither Stephen, the photographer, nor anyone standing with him noticed anything odd. The shadows were only spotted afterwards, while going through the evidence. On the second night, Stephen went back to the same area to purposely try to debunk the shadows, trying to use different angles to recreate them. He even had people standing on either side of him to help the shadows along, but no shadows appeared. Look at the photos on the left and let us know what you think. This photo was taken under the same conditions as the other two. Note the lack of shadows. This entry was posted in Ghost Hunts, Ghost Tours and tagged ghost, ghost hunt, ghost tour, ghost tour nc, Ghosthunt, ghosts nc, Ghosttour, ghosttours, hauntedlittleton, lake gaston, Littleton, Littleton NC, North Carolina, paranormal, paranormal activity, paranormalinvestigation, tour dates by Holly. Bookmark the permalink. Tour was great…..lots of activity. Can’t wait to tell all my friends. Great stories and sitings. So glad Steve and family have decided to dig into Littleton history and explore the unknown!